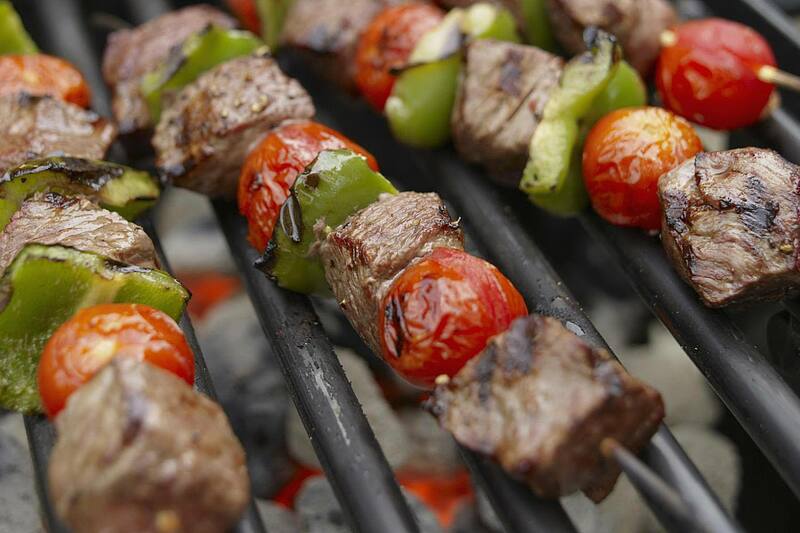 Kebabs, or meat on a stick, is one of the most popular and deliciously simple grilled dishes. You'll find them a part of many cuisines around the world, from the Middle East to regions of Asia, and are easy enough to recreate on your grill. Kebabs are quick and easy to make, and just as easy to eat, whether you are looking for something to prepare for guests or a simple summer evening supper. You can stick almost anything on a skewer, whether you are grilling traditional meat or making vegetarian kebabs. If you choose to grill meat kebabs, you can also grill vegetable kebabs at the same time to round out the meal. Or, pair the meat kebabs with a green salad, cole slaw, Greek salad, and rice or baked potatoes, as well as any traditional side dishes of the same cuisine as the kebab you are making. Almost a complete meal on a stick, this beef kebab features top sirloin, onions, peppers, and pineapple—all you need for serving is a bed of rice. The marinade hints of Asian flavors, combining soy sauce and ginger with sherry, brown sugar, and garlic, adding wonderful flavor to the beef while keeping it tender. Make sure to cut the ingredients in similar sizes so they all cook at the same pace. Colorful vegetable kebabs can be a vegetarian meal all in themselves or a perfect side to your grilled chicken or steak. Summer squash, onion, mushrooms, peppers, and eggplant are marinated in a lemony herb-mustard mixture, skewered, and then grilled (and basted with the marinade) until golden brown and tender. These vegetable kebabs are a great way to enjoy your summer garden produce or the bounty at the farmers market. In this traditional Middle Eastern recipe, also called kofta, the ground lamb is mixed with onion, garlic, spices, and ground almonds and then a portion is molded onto each skewer. It can be a bit challenging to get the meat to adhere to the skewer, but once they start cooking the lamb will solidify and take hold of the stick. These lamb kebabs are perfect served with grilled pita and yogurt sauce. This South Asian kebab can feature beef, lamb, chicken, pork, or even vegetables and, no matter what you skewer, will result in a fragrant, tender dish that is bursting with flavor. The secret ingredient is minced papaya, which works to tenderize the meat without infusing a fruity taste. Feel free to adjust the spiciness to suit your palate. These fish kebabs are coated in a balanced combination of Moroccan spices before being skewered and grilled, making them an extremely flavorful but not overly spicy way to enjoy white fish. A firm white fish is cubed and marinated in a mixture of oil, onion, garlic, cilantro, lemon juice, and spices. Serve with rice and more grilled vegetables or salad. A traditional Indian recipe for grilling chicken, chicken tikka kebabs are a skewered and grilled version of the classic bone-in recipe cooked in a tandoor. The rich marinade of spices such as coriander, ginger, garlic, and garam masala combined with creamy yogurt tenderizes the chicken while providing plenty of flavor. Grill these kebabs hot and fast and you'll have a delicious meal in no time. Serve with rice or chapati, raita, and vegetables. Typical street food in Japan, these chicken kebabs are quick to prepare and cook, making them an ideal appetizer or dinner on a busy night. Bite-sized pieces of chicken are marinated in a mixture of soy sauce, sake, ginger, and chives and then skewered and grilled. Perfect served over rice with hot soy sauce for dipping. The simple Greek flavors of oregano and lemon are all you need to transform lamb into a fresh and tasty dish, perfect inside warm pita with a dollop of tzatziki sauce, a mixture of yogurt, cucumber, lemon, and mint. Marinate the lamb cubes for a few hours, then skewer along with cherry tomatoes and onion, and grill. Serve as a sandwich or over rice with pita and sauce on the side. These beef kebabs are tender and delicious after hours of marinating in a combination of Asian seasonings, such as curry powder, soy sauce, sesame oil, and turmeric, as well as a bit of hot sauce (you can make them as spicy as you want to meet your tastes). Then simply thread onto skewers along with onion and bell pepper and grill until the desired doneness is reached. We all know pork and apples are a perfect pair, so when these pork kebabs are basted with an apple butter barbecue sauce, it becomes pure perfection. The pork cubes are first marinated in a mixture of olive oil, lemon juice, and garlic and then grilled; as they cook, a homemade sauce combining apple butter with ketchup, brown sugar, and Worcestershire sauce is brushed on, giving the kebabs beautiful color and flavor. Pair them with rice and a side salad, cole slaw, or grilled vegetables.